Structural wind loading requirements for buildings and other structures are specified in Chapter 16 of the IBC. The wind loading requirements are obtained primarily through reference to ASCE 7-10. The minimum requirements for wind loads must be used in design and are intended to ensure that every building and structure has sufficient strength to resist these loads without any of its structural elements being stressed beyond material strengths prescribed in the code. The code emphasizes that the loads prescribed in Chapter 16 are minimum loads and, in the vast majority of conditions, the use of these loads will result in a safe building. However, the code also recognizes that the designer may, and sometimes must, use higher loads than those prescribed to ensure a safe structure. The commentary to ASCE 7-10 is a good source to be consulted for additional information since it outlines conditions which may result in higher loading.4 In the event that wind speeds specified in the code are exceeded, there is an increased risk of structural damage and possibly failure despite the presence of safety factors in material design standards. For this reason, it is important to ensure that wind loads are properly determined. Building codes are intended to protect public health, safety and general welfare as related to the construction and occupancy of buildings and structures. To this end, they establish a minimum level of safety regardless of the building material used. In the case of wind-resistant design, codes address the probability and severity of high wind events by providing design requirements specific to regional risks. 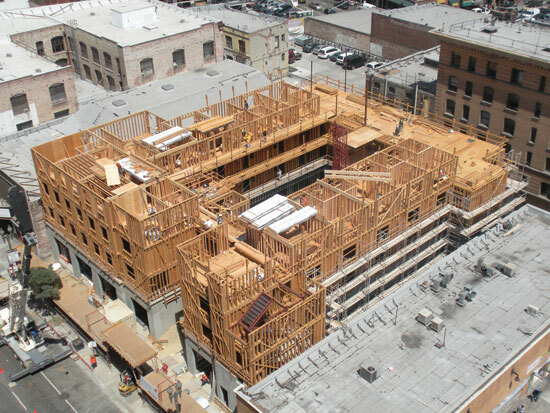 Wood buildings are often characterized by repetitive framing and numerous connections—which provide multiple, often redundant load paths for resistance to wind forces. Starting with the 2012 IBC, the term “Risk Categories” replaced “Occupancy Categories,” the term used in previous editions. Risk Categories are used to categorize buildings and structures based on their importance and include considerations such as risk to human life and societal need of the building or structure to function during and following an extreme event. Mapped wind speeds for Risk Category III and IV buildings, for which the potential consequence of failure to human life and/or economic impact is greatest, are greater than mapped wind speeds for Risk Category II buildings. Mapped wind speeds for Risk Category II buildings are greater than for Risk Category I buildings, for which the potential consequence of failure to human life and/or economic impact is relatively small. So for proper design, it is critical to identify the risk category of the building or structure when choosing the wind speed map. The mapped wind speeds for Risk Category II buildings are illustrated on page 4. Detailed descriptions of buildings and structures associated with Risk Category I, II, III and IV are described in IBC Table 1604.5. ▶ Risk Category I buildings represent a low hazard to human life in the event of failure, such as agricultural facilities and storage buildings. ▶ Risk Category II buildings are those not defined as Risk Category I, III or IV, which would include houses, apartment buildings, offices and stores. ▶ Risk Category III buildings represent a substantial hazard to human life, such as schools and assembly buildings with an occupant load greater than 300. ▶ Risk Category IV buildings are designated as essential facilities intended to remain operational in the event of extreme environmental loading such as power-generating stations, police and fire stations, and other structures having critical functions.